HIS EMINENCE CARDINAL RIGALI CELEBRATES MILESTONE EVENTS FOR SACRED HEART CATHEDRAL COUNICL 5207 AND BLESSES 2015 OFFICERS. On September 14th 2015 His Eminence Justin Cardinal Rigali continued to demonstrate his heartfelt support of the Knights of Columbus by honoring Sacred Heart Cathedral Council 5207 in many special ways at its monthly general membership meeting. His Eminence along with Knights of Columbus District Deputy Tim Brown presided over the installation and official blessing of the 2015-2016 council offices which included Sir Knight Jimmy Dee as Grand Knight, Sir Knight Shawn Comerford as Deputy Grand Knight, Sir Knight Tom Greer as Chancellor, Greg Guyotte as Recorder, Sir Knight Jim Manning as Financial Secretary, Sir Knight Russ Carvin as Treasurer, Scott Maentz as Lecturer, Gerard Jabely as Advocate, Sir Knight Scott Elmore as Warden, John O’Connor as Inside Guard, Chester Pun Cheun as Outside Guard, Casey Guinan as Membership Director, Jim Bruun as 3 Yr Trustee, Tom Ciaccia as 2 Yr Trustee and Herstle Cross as 1 Yr Trustee. 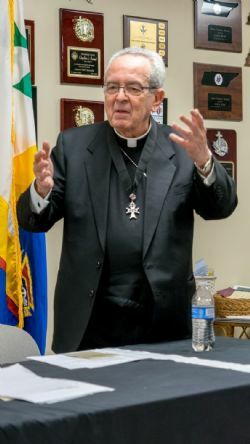 To show it’s appreciation for His Eminence’s lifelong service to Mother Church in addition to his outstanding support of the Knights of Columbus His Eminence was appointed honorary lifetime Chaplain for Sacred Heart Cathedral Council 5207 by Grand Knight Jimmy Dee on behalf of all its members. With more than 2 million members the Knights of Columbus is the world’s largest Catholic lay organization. It provides members and their families with volunteer opportunities in service to the Catholic Church, the community, families and young people. In 2014, the Knights of Columbus at all levels of the organization raised and distributed $170 million to charity and rendered 70 million hours of volunteer service. Knights of Columbus Council 5207 is proud to represent and serve the Sacred Heart Cathedral Parish and meets regularly in closed meetings every first Monday of the month. If you are interested in joining the Knights of Columbus contact Grand Knight Jimmy Dee at 865.809.3825 or by email at jp.deeii@gmail.com. Novena - A novena is a series of prayers that are said for nine straight days, usually as a prayer of petition, but sometimes as a prayer of thanksgiving, to obtain special graces. The nine days recall the nine days that the Apostles and the Blessed Virgin Mary spent in prayer between Ascension Thursday and Pentecost Sunday. When praying a novena you state your intention each day as part of the short daily prayer. St. Anne Novena – St. Anne is the Mother of the Blessed Virgin Mary and a great Saint! St. Anthony Novena – Well known for helping people find lost things. He was a Franciscan and is beloved by many. St. Augustine Novena – One of the greatest defenders of the Catholic faith and renowned prodigal son. St. Catherine of Siena Novena – A powerful and well loved saint who is also a doctor of the Church! St. Dymphna Novena – Patroness of Depression and Anxiety, she is helpful to many who suffer. St. Francis Novena – Founder of the Franciscan order whose holiness and tireless work helped reform the Church. Fulton Sheen Novena – Not yet a saint, but he was a great Catholic leader in America. St. Gerard Novena – Patron of Expectant Mothers. St. Joan of Arc Novena – Martyr and young saint from France who led the French army to several military victories at the direction of God. St. John Bosco Novena – Patron of the youth and founder of the Salesian Order. St. Joseph, Husband of Mary Novena – Husband of the blessed Virgin Mary and Foster Father of Jesus. St. Jude Novena – Probably the most popular of all the novenas, St. Jude is the patron of lost causes. St. Maximilian Kolbe Novena – Hero of the concentration camp Poland. St. Michael the Archangel Novena – Prince of Angels and protector of the Church. St. Monica Novena – Monica was the mother of St. Augustine and she is known for praying for mothers, alcoholics and wayward children. St. Padre Pio Novena – Padre Pio had the stigmata and he is beloved by many Catholics. St. Peregrine Novena – St. Peregrine is a popular saint because he is the patron saint of Cancer Patients and this is a novena for cancer patients. St. Philip Neri Novena – Known as the Apostle of Rome he was very humorous and had a big heart. St. Philomena Novena – Virgin and Martyr of the early Church, she is known for her powerful intercession. St. Therese Novena – A very popular Saint and doctor of the Church. She is well loved and known for promoting sacrificial love in small things. Mother Teresa Novena – Not yet a Saint, but she was a Nobel Prize winner and helper of the poorest of the poor. A liturgical novena is one that is prayed in cooperation with the liturgical calendar. This type of novena leads up to an important feast of the Church. It generally ends the day before the feast. A novena is a really great way to prepare spiritually for the major feasts of the Church. Annunciation Novena – When the angel announced Jesus’ birth to Mary. Assumption Novena – When Mary was assumed into heaven at the end of her earthly life. Christmas Novena – The birth of Jesus. St. Andrew Christmas Novena – Longer Christmas novena beginning on the feast of St. Andrew. Divine Mercy Novena – The devotion given to us by Jesus through St. Faustina. Immaculate Conception Novena – The celebration of Mary’s conception without sin. Nativity of Blessed Virgin Mary Novena – The celebration of the Virgin Mary’s birth. Novena to the Holy Spirit – The celebration of decent of the Holy Spirit at Pentecost. 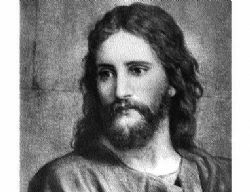 Novena to the Sacred Heart of Jesus – The devotion given to us by Jesus through St. Margaret Mary. Christ the King Novena – The feast of Christ the King. Have you ever started praying a novena only to forget to pray it after a few days? It's very easy to forget and it happens to nearly everyone who prays novenas. This website to helps me to remember to pray all 9 days of the novena prayers. You get a daily email reminder with the novena prayers right in the body of the email. Now, if you’re like me, you check your email every day. So, when you’re checking your email, you will be reminded to get praying! It turns out that I’m not the only one who needs reminding… So far, over 200,000 people have joined in praying novenas with the help of these little reminders! I believe you'll feel a sense of peace and comfort joining in these prayers with such a large community, each of us praying in our homes — or schools — or hospitals — or churches — or wherever else you may be praying with us. Novena pays tribute to a saint whose miracles speak volumes about her powerful intercession! Although little is known about her, tradition has it, from the private revelations given a Dominican nun by Saint Philomena herself in the 19th century, that she was killed at the age of 13 by the Roman Emperor Diocletian in the early 4th century when she would not give into his advances and become his wife. (Diocletian is most infamously known for his savage persecution of Christians.) This great saint’s patronage includes children, Children of Mary, priests, and desperate or lost causes! Sign up to pray for Holy Ghost's Enthronement mission. 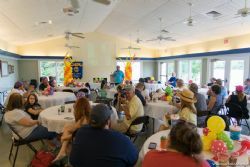 A great time was had by all at the July 2015 Family Picnic. Great BBQ provided by Tom Greer, DJ kept us entertained, weather cooperated for the most part and fun and games abound thanks to the expert leadership and planning provided by Matt Law. Please check the link below for more pics! After presiding over his Sunday mass Father Adam Kane, Chaplin of Knights of Columbus Council 5027, blessed the new parking shuttle and service that is being provided to the Sacred Heart Cathedral by its' parish Knights members. The Knights parking shuttle will be in service during high attendance masses and other events and staffed by volunteers from the Knights of Columbus Council 5207. As parking conditions change during construction of the new Cathedral the shuttle will help make getting around the SHC campus a bit easier especially for those with special needs. See PDF file for more pictures! Pictured Left to Right: Sir Knight Tom Greer, Rob Sanders, Jim Piehl, David Perry, Eric Erfman and Sir Knight Jimmy Dee. 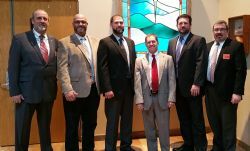 In a ceremony held at St. Thomas the Apostle Church on Saturday March 14th 2015 four members of the Knights of Columbus Council 5207 advanced to the status of Knights of the Third Degree. Through the ceremonial tradition led by State and National KofC representatives of the Knights of Columbus, Council 5207 members Rob Sanders, Jim Piehl David Perry and Eric Erfman have joined the ranks of fellow Third Degree Knights of Columbus members from around the world. Sacred Heart Cathedral Knights of Columbus Council 5207 presented a donation resulting from a recent fundraising drive in the amount of $3,997 to Sunshine Industries of Knoxville. 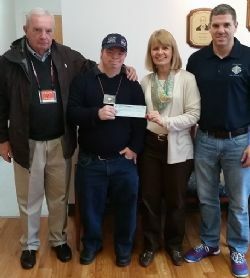 Sir Knight Matt Stone presented the check to Sunshine Industries Executive Director Judy Wohlwend at their offices along with Sir Knight John Stone and Deputy Grand Knight Steve Garvin. The Knights would like to thank everyone who volunteered and donated during the weekend long street fundraising campaign held back in December 2014. "We are blessed by the generosity of our parish and the community and are so very pleased to be able to support local a charitable program such as Sunshine Industries with a donation of this size." shared Deputy Grand Knight Steve Garvin (chairman of the street fundraising event). Sunshine Industries owns and operates a number of programs that serve persons with a wide variety of disabilities, including intellectual disabilities, mental illness, autism, emotional and behavioral disorders and learning disabilities. The Knights of Columbus is a fraternal organization of Catholic gentlemen consisting of over 2 million members worldwide. 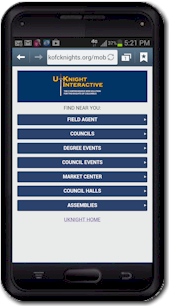 The Knights provider over 70 million hours of volunteer services to the church and community and provide over $170 million dollars to charitable causes each year. If you are interested in joining the Knights of Columbus please contact Grand Knight Jimmy Dee at 865-809-3825 or speak to any Knight of Columbus member. This is a link to various projects other Knights have worked on. 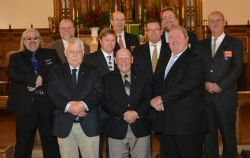 In a ceremony held at Holy Ghost Catholic Church on Saturday November 15th five members of the Knights of Columbus Council 5207 advanced to the status of Knights of the Third Degree. Through the ceremonial tradition led by State and National representatives of the Knights of Columbus, Council 5207 members John O'Connor, Ray Barkowski, Micheal Hickey, Greg Guyotte, and Scott Elmore have joined the ranks of fellow Third Degree Knights of Columbus members from around the world. Middle row: Left to Right - SK Jay Meadowcroft, Greg Guyotte, Scott Elmore, SK Tom Greer. Back Row: KofC - State Deputy SK John Parks, Supreme Director SK Mike Wills, State Treasurer SK Tracy Staller. Congratulations to our new Second Degree Knights! Please join us in congratulating our newest Second Degree Knights! They attended thier second degree ceremony Monday the 13th of October in Oak Ridge. Left to Right in the picture is: Ray Barkowski, Eric Erfman, Wayne Erin, John Moss and Greg Guyotte. Picture: Raymonde Lundy opens gifts with 5207 Council wife Joan Stone. 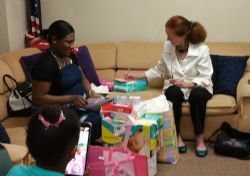 The wives of Sacred Heart Cathedral Knights of Columbus Council 5207 recently hosted a baby shower to help Francois and Raymonde Lundy prepare for the upcoming arrival of their second child later this month. The event was organized by council wives Cindy Carvin, Joan Stone and Valerie Dee and was attended by relatives of the Lundy family along with many generous and supportive Sacred Heart Cathedral Parish women. Francois and Raymode Lundy are members of the Sacred Heart Cathedral Parish and refugees from Haiti who moved to Knoxville with the help of the Haiti outreach program. The council wishes to thank the many people who gave so generously of their time, talents and treasure to make the evening a very special event for the Lundy family. The Tennessee March For Life was held Sunday January 25th 2015 at the Worlds Fair Park downtown Knoxville. Over 150 people turned out to celebrate life and march for its moral and legal protections. The march was led by Knights of Columbus 4th Degree Color Guard and Color Corps Commander Russ Carvin of Sacred Heart Cathedral. Sir Knights Tom Greer and Steve Kaye also of Sacred Heart Cathedral marched while presenting the National Colors on behalf of Monsignor F.D. Grady Assembly 1083. The 4th Degree is the highest degree of the Knights of Columbus. It is offered to those Knights who have shown themselves to be especially solicitous of the welfare of their church, their families, their community, and their nation. One of the most active charitable organizations in the United States, the Knights of Columbus has grown to include more than 2 million members worldwide. Last year, Knights donated more than $170 million and more than 70 million hours to charitable causes. Men of the Cathedral Parish who are interested in joining the Knight of Columbus may contact membership director Jimmy Dee at 865-809-3825 or by speaking with any Knights of Columbus Member. 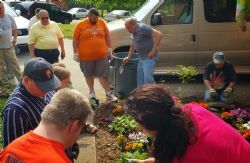 Sacred Heart Cathedral Knights of Columbus work with Beta House 2 residents to beautify home with new flower gardens. The Sacred Heart Cathedral Knights of Columbus and their families recently spent some quality time with the residents of the Sunshine Industries Beta House 2 to help beautify their front yard with donated flowers and labors of love. After a morning of tilling and planting the Knights dedicated the front garden for the enjoyment of the residents who enjoy using the garden for prayer, relaxation and reflection. Sunshine Industries Beta Homes are residential programs serving adults with intellectual disabilities and/or mental illness. There are currently two 10-person group homes with 24/7 staff supervision. Training by staff promotes personal growth and development for residents who require consistent structure and supervision. Residents generally work at Sunshine Industries or participate in the Retirement Program. The supervised and structured living environment allows individuals the opportunity to live successfully in the community. 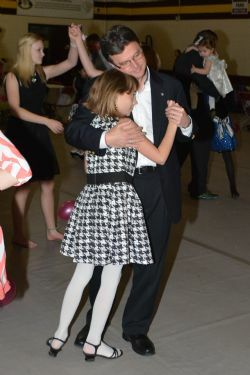 Over 150 dads and daughters attended the Knights of Columbus 2015 Father Daughter Dance held this past Friday (Valentine's Day Eve) in the Sacred Heart Cathedral School gymnasium. Decorated in the traditional red and pink colored theme of St. Valentine’s Day Dads, Daughters and friends danced into the evening enjoying a wide variety of music including some classics that even Dad’s and Granddads could remember from their younger days. The event was organized and hosted by the Knights of Columbus Council 5207 who also provided a free professional photo portrait area to help commemorate the evening for the attendees. The evening’s portrait photos can be viewed and downloaded for free by visiting http://goo.gl/TaUhRP. On Saturday March 21th 2014 Worthy Sir Knights from across the diocese of Knoxville including Sacred Heart Cathedral's Scott Elmore received the honors of the Fourth Degree of the Knights of Columbus in an exemplification honoring Rev. P.J. McGinnity. 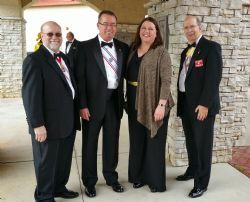 Under the direction Michael J Porter, Tennessee District Master, 17 Worthy Sir Knights were honored and then celebrated by state, regional and national Knights of Columbus officers. Included in the ceremony were Michael L Wills, Supreme Director and John F. Park, Jr. Tennessee State Deputy. Immediately following their exemplification ceremony the Fourth Degree Knights attended Mass at St. Thomas the Apostle Church celebrated by Bishop Stika with Rev. P.J McGinnity and Rev. Potian Kiyimba concelebrating. A formal reception was hosted later that evening for the new Fourth Degree Knights and their families in the St. Thomas the Apostle family center. Scott now joins his fellow Fourth Degree brother Sir Knights locally in the Monsignor F.D. Grady Assembly 1083. Fourth Degree Knights are dedicated to the personal development and continued honor of brother knights, glorifying God by serving their communities and their nation and providing spiritual support to those who defend the United States of American in military service. 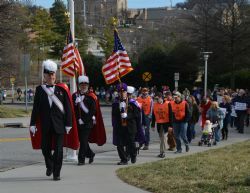 The Fourth Degree Knights also provides a visible reminder of Catholic brotherhood and service through a dedicated Honor Guard that can be seen at many ceremonial events.